If you prefer, you may download the Installation Manual and Users Guide pdf using the link at the right. 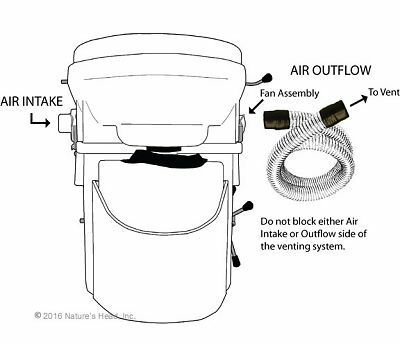 Your NATURE’S HEAD® composting toilet comes with most of the items necessary for completion of your installation. The outside vent is not included because each application is different and many will require a different vent. Also the 12V to 110V Transformer is not included because all installations do not require this. … for My Tiny House installation? If you are using 110 volt house power, you will need our wall transformer. If using 12 volt, batteries and or solar, the toilet comes with the necessary parts. Our PVC Vent Assembly is an easy way to vent through the wall or ﬂoor. … for My RV installation? The toilet comes with the 12 volt parts needed. Only if using 110, house power you will need our wall transformer to plug into an outlet to power the fan. The mushroom vent is an easy way to vent through the side or roof. The PVC Vent Assembly is good for through the ﬂoor venting.You may already have an existing vent to connect to. … for My Cabin installation? The toilet comes with everything for a 12 volt system. If using 110, house power you will need our wall transformerto plug into an outlet to power the fan. The PVC Vent Assembly is a good way to vent through the wall or the ﬂoor on a raised cabin. … for My boat installation? The toilet comes with the 12 volt parts needed. The venting, you can use the Mushroom Ventfor cabin side or roof. It can also be used over an old pump out ﬁtting hole. Some installations may require increased Venting Hose lengths which may be purchased on a per foot basis. PVC pipe, which may be obtained at most home improvement or hardware stores, may also be substituted for longer hose sections. For ﬂoor construction other than wood, a different type of mounting bolt may be required. 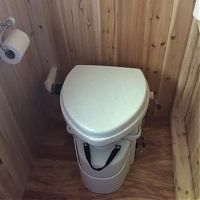 If the installation is on concrete ﬂoor, many customers have found it convenient to mount the toilet to a section of plywood rather than trying to drill masonry. The plywood can be placed on the concrete ﬂoor and painted or varnished for appearance. If regular household current is available (110 volts), the head can be powered by a 12 volt Power Transformer (AC Adapter). 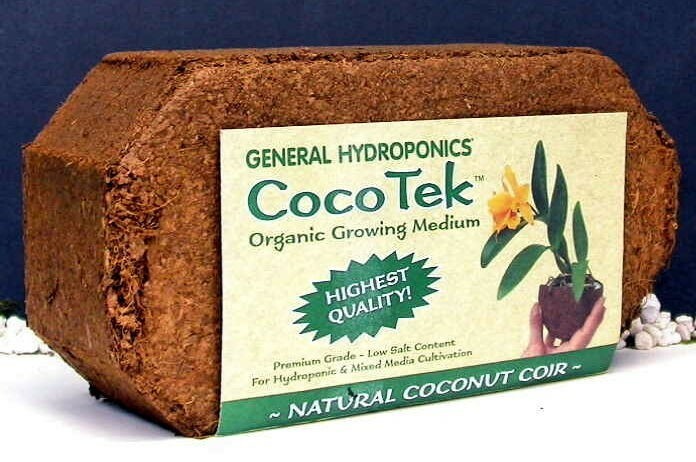 These may be purchased from Nature’s Head, Inc. Some type of composting medium is required. When selecting the location for your new Nature’s Head®, be certain to allow enough space behind and on both sides for the toilet to function and be serviced. Be sure that the lid will open fully. You must also be certain that the bowl has enough room to tilt rearward to allow for its removal and for the removal of the liquid tank. If mounted against a wall or bulkhead, allow a minimum of 1½ inches between the toilet and the wall. It is necessary to allow adequate room for the hose connection and agitator handle. Both of these may be relocated to the opposite side of the unit if needed. In some space-restricted areas it may be necessary to offset the toilet to one side or even turn the toilet slightly to one side to allow for extra clearance. With the standard handle attached, the width of the unit is 21 inches. For more conﬁned spaces, the optional spider handle decreases the width to 17 ¾ inches. Two inches, to the left side of the head (as you face it), is required to slide the bowl off the slip hinge for servicing the base. 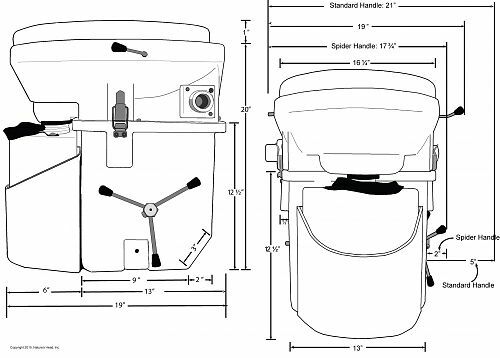 In severely conﬁned spaces, removing the mounting knobs and sliding the toilet away from the mounting location may be a more desirable method of servicing the unit. It is necessary to secure your toilet to the ﬂoor using the two L-brackets. 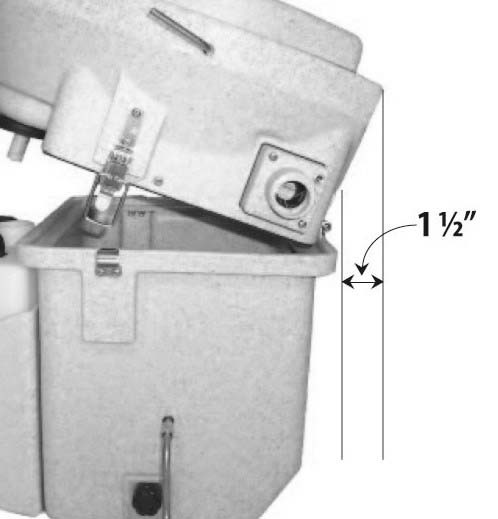 The normal mounting is to position the L-brackets under the base in the recesses in the toilet, as shown on the left. Counter sunk mounting screws are included for installing to a wood ﬂoor. To mount the L-brackets to the ﬂoor, position the base of the toilet in the previously selected location. Attach the L-brackets to the toilet with the knobs provided. If you choose to mount the L-brackets facing out (not under the toilet) simply mark the holes of the brackets on the floor with a pencil for drill locations. If you choose to mount them under the toilet, carefully trace around as much of the outline of the bracket as possible. Measure the distance between the bracket and the lines you drew. Now remove the brackets from the toilet and move the toilet out of the way. Carefully position the L-brackets inside of the lines that you drew and mark the holes for drilling. Before drilling any holes in your ﬂoor or walls, be sure you know what is behind them! The holes in the brackets are for #12 countersunk bolts or screws. If you are using the screws provided you will need to drill a 1/8 inch pilot hole in the drill marks you made on the ﬂoor. If you are uncertain if your brackets are positioned correctly, drill and mount just one bracket. Then reposition the toilet and mount to the one attached bracket. Check the positioning of your other bracket and marks. If all looks good, proceed with drilling and mounting the other bracket. If your markings are off, adjust your lines and proceed with mounting the second bracket. If mounting the toilet to a ﬂoor that will get wet frequently, a small amount of sealant should be placed in the holes before installing your screws. Attach your toilet and check to be sure everything works and ﬁts as you intended. Do not over tighten the hold down knobs as you will damage the threads in the base! The unit must be vented to the outside of your cabin whether it is a boat, RV, truck, or vacation property. 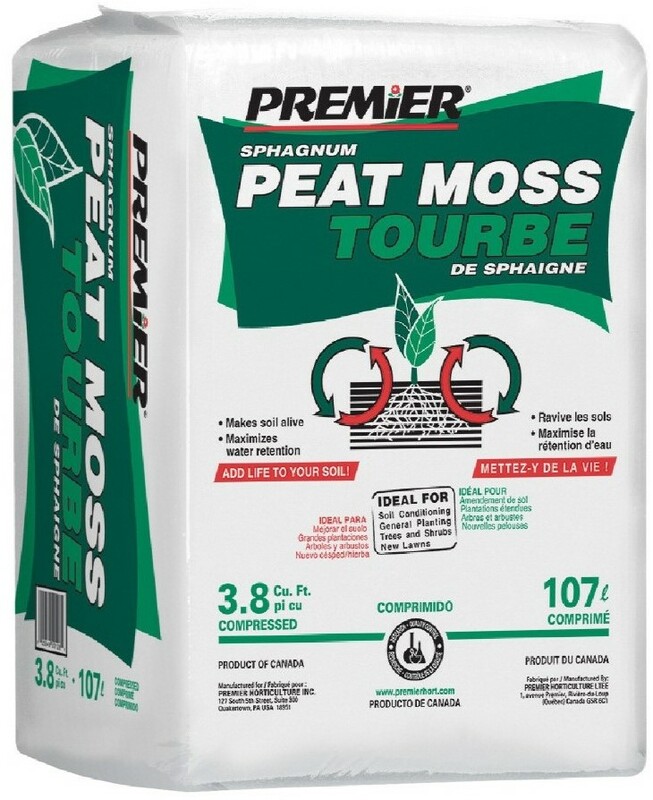 This helps keep your bathroom smelling fresh, and allows for proper growth of beneﬁcial bacteria which facilitates the composting process. Installing the venting system will be the most difﬁcult portion of the installation. The average do-it-yourselfer should be able to easily accomplish this if one is familiar with and has the proper tools. Depending on the type and placement of your vent, you may be required to cut holes in the wall, ceiling, or the ﬂoor. If you are unsure if you are qualiﬁed to complete this portion, it may be wise to hire a contractor or handyman to do this for you. Due to the variety of ventilation choices available, the external vent has not been provided. Mushroom vents, solar vents, and our PVC Vent Assembly Kit are commonly used for venting to the exterior. All of these can be purchased from Nature’s Head. The unit may be vented vertically through the roof, or most common horizontally through the wall, or down through the ﬂoor. For installations in homes, cabins, and other permanent structures the venting can be placed horizontally through the wall with our PVC Vent Kit. 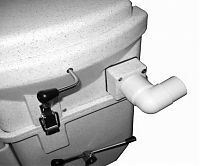 This vent ﬂange, included with the toilet, is used beneath a mushroom vent or solar vent and connects directly to the hose. 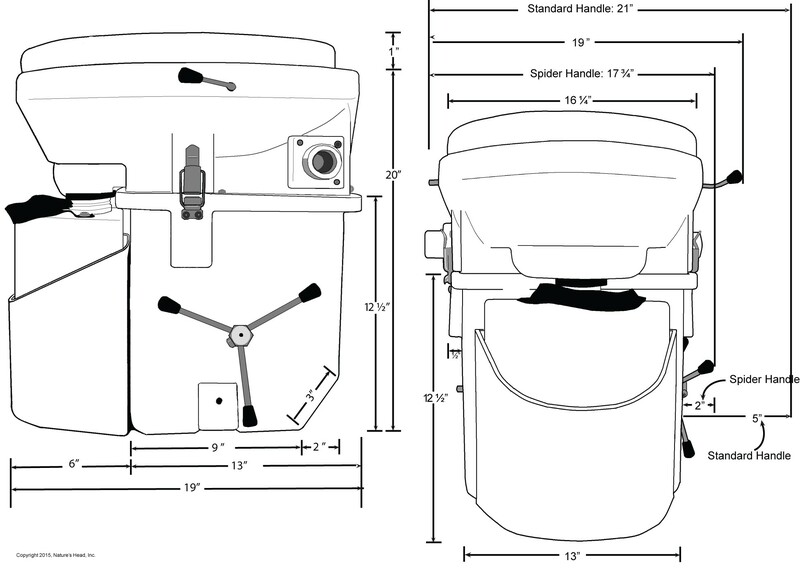 The toilet is shipped with the agitator handle unattached and must be installed before use. The standard handle is attached with a collar and hairpin clip, while the spider handle attaches with an allen set screw and locknut. 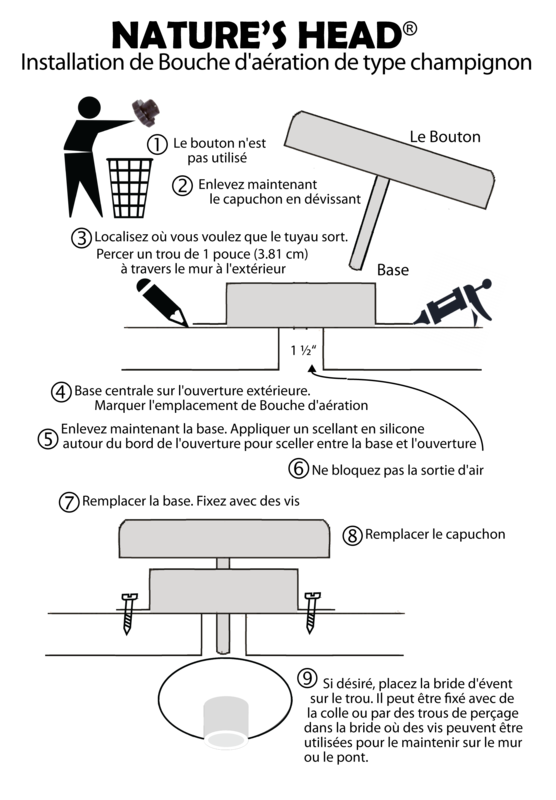 In the event that the handle must be moved to the opposite site of the base, the agitator must be manually removed, reversed, and reinstalled. If installation of the ventilating hose is more favorable on one side of the unit than the other, the fan/ﬁlter housing is interchangeable with the ﬁlter-only housing. This is accomplished by swapping sides with the components and their respective housings. Attaching a mesh fabric or screen (not provided) over the opening is necessary to prevent the entry of insects into the system. Any mesh fabric such as window screen or nylon netting will provide an adequate insect barrier. 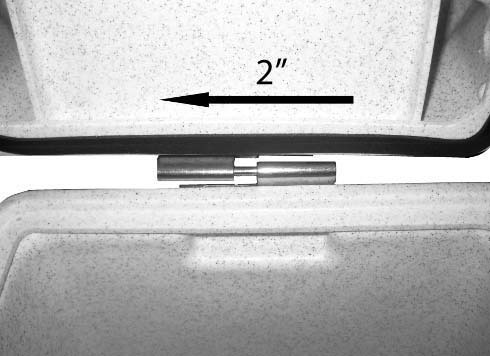 If a sharp 90 degree turn from the fan housing is needed, a 1¼ inch PVC street elbow (not provided) may be used to achieve a proper conﬁguration. 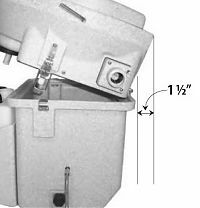 Installations on boats and RV’s are easily managed with the stainless steel mushroom vent with the built-in screen and adjustable top which is self-sealing. 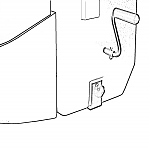 In this case, the vent flange provided with the toilet would be placed on the inside wall around the opening to the vent with the flat side to the wall. 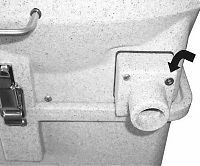 On many boats, the pump-out ﬁtting can be removed and the mushroom vent mounted over the existing hole. The venting hose provided with the unit will attach directly to the adapter. Clamping the hose to the fan housing is not necessary on the connection for the head, and normally not necessary on the exterior connecter. With an overhead connection, you may ﬁnd it necessary to clamp this end depending on the amount of support provided for the vent hose. If the hose is supported properly, you will probably not need a clamp. The vent hose must be attached to the housing which has the fan inside it. The unit is designed to pull fresh air through the head and ventilate it outside. If you disassemble the fan housing, always check to be certain that the fan is blowing out of the vent before re-attaching the vent hose. As with all electrical connections, be sure your head is on a fused circuit. The fuse should be no less than 2 amps and no more than 5 amps (12V). A fuse holder and fuse are provided for use in a non-protected 12 volt system such as direct attachment to a battery. The fan may also be powered by a 110 volt source with a Power Transformer (AC Adapter) that reduces the power to 12 volts. If the system is being powered by the 110 volt Power Transformer (AC Adapter) disregard the fuse, fuse holder and single pin cable as they are intended for use ONLY with a 12 volt power source. No fuse is required when using the Power Transformer (AC Adapter). These Power Transformers (AC Adapter) are available through Nature’s Head,Inc. If you are unsure about your wiring system or requirements, consult an electrician. 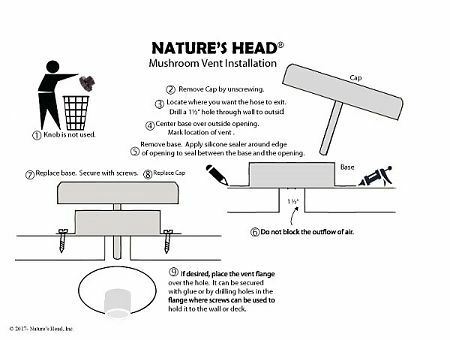 If you are unsure of a particular step in the installation of your Nature’s Head, please check the FAQs for Installation on our website, www.natureshead.net. If you are unable to resolve the issue, send us an email giving your name, phone number, address, distributor name, and a brief description of how we may help.